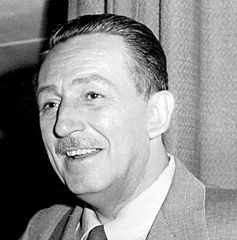 Walt Disney is without one of the most famous people of the 20th century and most people know hardly anything about him. Although he became one of the most successful men in history, he school at 16 and then studied art for a short period of time. By the 1920s he had started to produce cartoons in Hollywood in with his brother Roy, who, for reason, never to become as famous as Walt. Disney is perhaps most well known on of his of his lovable cartoon character , Mickey Mouse, who first in 1928 in a film called Steamboat Willie. One of the most cartoon films of all time is Snow White and the Seven Dwarfs, which, when it was in 1937, was the first full-length cartoon in the history of the cinema. the middle of the 20th century , Walt Disney had become one of the world's most important of films for cinema and television. As Disney Productions , Walt Disney retained complete artistic control of the films and he also on to publish books for children and cartoon strips in newspapers, featuring such as Donald Duck and Pluto, the dog.